How Much Wind Power We Need? Here's the ANSWER! How Much Wind Power We Need? A monosyllable response to this highly significant question would simply be Enormous! Yes, we need colossal amounts of wind power to reach the goal set by the US Department of Energy (DOE). However, before delving deeper into DOE, let us take a look at what others are saying about wind energy, globally. A report was recently published that <?xml:namespace prefix = st1 ns = "urn:schemas-microsoft-com:office:smarttags" />China is desperately producing wind power in a massive scale and would be producing well over 100 giga watts of wind by 2020. But people in Uncle Sam’s own country are not sitting pretty either. A report from a cleantech consulting firm called Emerging Energy Research claims that the US is now the world’s fastest growing market for wind power and would shortly become the planet’s largest producer of wind energy, surpassing Germany’s 22 gigawatts. “If this growth rate remains unabated for the next few years,” predicted the firm, “USA could hit 150 gigawatts by 2020 without fail. In fact, there seems to be no limit to our demand for wind power. It is environt-friendly, cost effective (cheaper than solar power) and needs no effort or fuel to run. Besides, it is available in plenty and is ever renewable. Reverting back to DOE, we find that it has come out with a new Funding Opportunity Announcement (FOA) for up to USD 6 million over the next two years, i.e. FY09 – FY10, subject to annual appropriations, mainly to address the technical challenges relating to wind development vis-à-vis market acceptance that were outlined in the 20% Wind Energy commitment by 2030 report published sometime ago. However, the funding would be available for projects comprising several different topic platforms that include (a) Turbine Research; (b) Development & Testing; (c) Distributed Wind Technologies; (d) Market Acceptance efforts; (e) Environmental Research & Sitting Strategies; (f) Transmission Analysis; (h) Planning & Assessment and (i) Workforce Development. If we take a break here and try to see how much wind power we need in the future, we can come up with just one conclusion – and that would be, as much as would be available. The fact is, the fossil fuel reserves are almost over and so we are compelled to look at alternatives. The pollution level with green house gases has also reached alarming levels. Wind power and other alternative energy sources come as Godsend in this because it lets us stay energized and also clean up the air. But that is not all – wind power can also reduce the electricity bills drastically because once the system is up and running, it virtually costs nothing to produce the electricity. This is why the Governments and local authorities in many parts of the world are offering incentives to opt for alternative energy sources such as wind power. 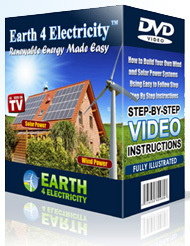 What more – if you set up a system at home and produce your own personal wind power, you are also allowed to sell of any excess power that you produce, and this naturally helps you earn some extra money. All you need to do now is learn a few important things such as where to set up your system in the home, how to do it and also wire the system to make it functional, where to get the parts from cheaply and also, learn about the safety precautions that are to be followed. Get this manual that will help you learn about all this, and you will be ready to go.